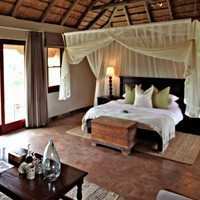 Accommodation at Hlosi Lodge is provided in our luxury suites. Choose from a luxury safari tent, a one-bedroom suite for a romantic safari experience or a two-bedroom family suite. Guided by an experienced Ranger on an open Land Rover, Hlosi Game Lodge offers an experience aimed at providing visitors with an experience of the diverse wildlife and landscape. Hlosi Game Lodge offers 4-star family-friendly safari trips in the malaria-free Amakhala Game Reserve, Eastern Cape South Africa. Hlosi Game Lodge is a small 14-room game lodge in Addo, near the city of Port Elizabeth offering rich wild life game-viewing and luxurious game lodge accommodation for the whole family . Our six suites and eight luxury tents lie along a gentle curve of a hill above a river plain, and offer wide-open views from your private deck. The main lodge includes elegant lounge and dining areas, and a hard-to-leave bar overlooking the swimming pool and waterhole. Hlosi offers a unique, intimate safari trip with personal game viewing experiences. We're privileged to be able to share our love for conservation, food and life with you. Our four double suites, four luxury tents, four family tents and two 2-roomed family suites may also be booked exclusively as an intimate venue for small team-building events, conferences and weddings. 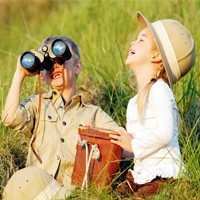 Day and night game viewing trips under guidance of professional game rangers are available. Wildlife likely to be encountered during the game drives in the Game Reserve are: the "Big Five", lion, elephant, rhino, buffalo and leopard as well as cheetah, giraffe, zebra, wildebeest and plenty of antelope species. 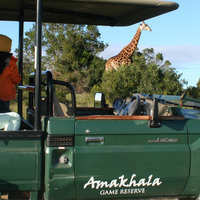 Read more about our game drives here. The main lodge is centered on the large entrance rondavel ("round room"), which opens onto a large outdoor deck. The two double-sided fireplaces in the main lodge are always a place of contemplation in winter. During summer, the shady verandah overlooking the waterhole and the refreshing pool keep guests cool and entertained. A separate area known as a “boma” adjoins the main lodge. Here we hold our bush braais and special festivities by firelight.